The Bi–Stander collection of cycle stands and bike racks offers a range of economically effective cycle storage solutions, ideal for schools and offices. Our Sheffield Hoop cycle stand is the classic solution for cycle storage. The hoops can be bought individually so you can have more control over the amount of bicycle storage you provide. 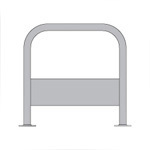 Manufactured from a steel framework with Armortec® Coating, the Bi-Stander™ Sheffield Hoop Cycle Stand range provides the ideal solution where uncovered bike parking is required. Individual hoops available in a choice of colours. Models SH2A and SH2B available with a choice of galvanised steel or Armortec® Coating in Anthracite Grey. Models SH3A, SH3B, JSH2A and JSH2B available with Armortec Coating in Anthracite Grey only. SH3A: individual Sheffield hoop with cross-bar and bolt-down ground fixing. SH3B: individual Sheffield hoop with cross-bar and concrete-in ground fixing.